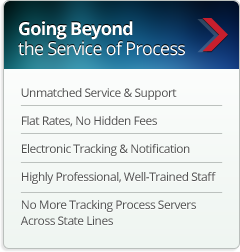 Going Beyond the Service of Process is more than just a guarantee as to why you should choose Writ Legal when it comes to your service of process, its about solutions when it you are dealing with a hard-to-serve process or when other process serving companies simply give up when they cannot serve your process. Let’s face it, we come across these types of services from time to time but we offer solutions that get the job done. What happens if a service of process is not successful? Unfortunately, sometimes a service of process may be unsuccessful for a myriad of reasons that lie outside of the process server’s control. For example, the service address for the defendant or deponent may be vacant, or the subject may have moved to another location before one could perfect service, or in some cases, the individual may even be evading service! Sometimes these methods enable us to accomplish service on the individual or entity that we are serving. However, in the event such methods prove to be unsuccessful, Writ Legal has extensive experience in handling such situations. What possible options do I have for serving a process at this point? What sets our Affidavit of Due Diligence report apart from the rest? Detailed documentation of all service attempts and the number of service attempts in the form of a report fulfilling your state’s service requirement(s) for process as outlined in the Rules for Civil Procedure. Supporting documentation compiled by our expert skip-tracing staff as it pertains to the details of your due diligence report. Customized formatting of your affidavit of due diligence report to conform to your firm or state/court’s requirements as outlined in the Rules for Civil Procedure. The very nature of our detailed Affidavit of Due Diligence reports has repeatedly saved our clients valuable time and money. We believe that it is our duty to go beyond the service of process by ensuring your satisfaction. As our client, you may consider Writ Legal as an extension to your firm- working together in getting the job done. Do not let another process serving company fail you by merely offering a rather meager affidavit of non-service, leaving you with unanswered questions and a large bill to pay. Let Writ Legal handle your Process Serving needs with the confidence, quality, and trust you deserve. *These options should not be misconstrued as comprehensive or intended to provide legal advice. The information provided on this page is for informational purposes only and should only be used as a guide to how past clients’ have chosen to utilize some of the services Writ Legal provides. These options may or may not be a solution for you depending on your case and circumstances. If you are handling your case pro-se (without legal counsel), we strongly encourage you to consult your attorney as we do not offer legal advice and we are not attorneys.